Mail.Ru Group Limited (LSE: MAIL), the largest internet company in Eastern Europe and the leader of the Russian online gaming market, and Crytek GmbH (“Crytek”), one of the world’s leading independent development studios for interactive entertainment, announced today that they signed a publishing deal for Warface. Mail.Ru Group Limited (LSE: MAIL), the largest internet company in Eastern Europe and the leader of the Russian online gaming market, and Crytek GmbH (“Crytek”), one of the world’s leading independent development studios for interactive entertainment, announced today that they signed a publishing deal for Warface. The free-to-play first-person shooter (FPS) is based on Crytek’s award winning game development solution CryENGINE®3 and will be released and operated by Mail.Ru Group in Russia and the CIS countries. 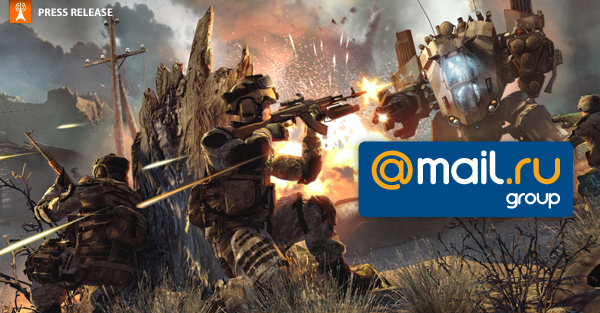 “With Mail.Ru Group we have found a perfect partner for publishing Warface in Russia and we are looking forward to releasing Crytek’s newest IP together. Given Mail.Ru Group’s incredible experience and expertise we are convinced that Warface will raise the quality bar and set the standard for the next generation of massively multiplayer online shooters”, said Avni Yerli, Managing Director of Crytek GmbH. - Cooperative game play in Player vs. Environment (PvE) missions with a challenging state-of-the art artificial intelligence and massive boss fights. - Competitive and fast paced Player vs. Player (PvP) action. - High level of team play in both PvE and PvP, four different player classes, cooperative special moves. - Real-time weapon customization for adaptive changes in play style. For more information about Warface please visit www.warface.com.